Comments/Context: The process of artistic iteration is a little like gamely following a trail in the dark. At the beginning, there is a defined starting point, an approach to moving forward, and a general direction in which to head. But along the way, small deviations take place, both intentional and chance-driven, that push an artist off the main pathway and into the thickets to the side. And as these changes pile up in iteration after iteration, the whole repetitive process becomes transformed and abstracted, the results often bearing little resemblance to the original. And this of course is the point – by deliberately letting go of strict control, an artist gives his or her process some room to breathe, introducing the potential for some serendipitous forks in the road. Aspen Mays’ first solo show with Higher Pictures encourages us to follow along as she carefully steps her way through the paces of her iterations. In one series of works, she begins with her great grandmother’s bandanna; in another, she starts with a similar vintage article once owned by Georgia O’Keeffe. In both projects, Mays is rooted in the magic of the darkroom, using variations on the photogram process (including physical folds, dyes, and other in-the-dark machinations) to interweave inspiration and action. A tiny starburst pattern, with branches that grow into sparkling ends, is the central motif in the family bandanna. 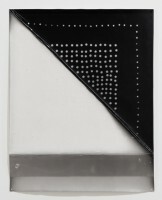 It makes its first appearance as the subject of a four part photogram, where each panel shows the transparent bandanna folded edgewise into a triangle. Mays then used the pattern as the template for a “negative” she has punched into a sheet of black plastic. This ragged holed sheet was then returned to the darkroom and used to make a series of three iterative photograms in red, blue, and yellow. The pattern was repeatedly exposed and allowed to build up into dense explosions of lines and dots, the final works delicately intricate, like filigree or drypoint etching. In Mays’ hands, it’s as if the fragile essence of the bandanna evolved into something even more faintly exquisite. The O’Keeffe bandanna takes a different set of turns. Many of the photograms using this fabric as inspiration are made from papers that have been folded multiple times and then punctured with thumbtacks and small pins, echoing the patterns on the original bandanna. When the papers are unfolded and developed (in part), white dots appear on the black surface, either as tiny holes or larger circles where the head of the tack interrupted the exposure. The arrays of dots march across the squares and triangles in strict but imperfect order, where real physical folds and apparent folds become confused. Some of the works have been further steeped in indigo dye (the same color as the bandanna), adding a rich blue tint to the mix. This dying process then leads elsewhere – when a box of emulsion-less photo paper was discovered by Mays, she experimented with dying the papers blue, leaving the folds as the only interventions. Still other works on view center in on a paisley motif, starting with a fabric square, cutting out the individual patterns, and then reassembling them in grids and string-delineated geometries. Mays then made photograms of the original rumpled fabric (now filled with cut out holes) and the removed parts, reintroducing the indigo dye in some cases. What emerges from all this iteration is an overall feeling of ideas actively being generated, tested, and adapted, only to be discarded or used as the basis for another round of creative thinking. While Mays began with personally resonant objects, she ends up with multi-layered process-rich abstractions, the original connections only vaguely visible. Photographically, her works feel like exercises in intentional stripping away and breaking down, until the point that something new and unexpected comes forth. Like links in a chain, they represent the evidence of an ongoing search, where one technique begets another in a constant stream of open-ended trial and error. Collector’s POV: The works in this show range in price from $5000 to $9000, generally based on size. One group of three photograms is sold as triptych, and is also priced at $9000. The plastic negatives are NFS. Mays’ work has little secondary market history at this point, so gallery retail remains the best option for those collectors interested in following up.